The Comfort Inn hotel is located off Interstate 90, just minutes from area attractions including the Valley View Mall, the Omni Center, Mount La Crosse, the University of Wisconsin - La Crosse and Viterbo University. This Onalaska hotel is also close to the Hixon House, Island Girl and the La Crosse Municipal Airport. The Swarthout Museum and the La Crosse Queen are less than five miles from the hotel. The hotel is near several shops and local restaurants and cocktail lounges, which include Famous Dave's, Panera Bread, Rocky Rococo's, Grizzly's, Piggy's, Seven Bridges, Applebee's and TGI Friday's. 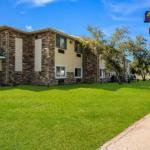 Hotel features and amenities include free coffee, free wireless high-speed Internet, an indoor pool and a sundeck. Enjoy our free hot breakfast featuring eggs, meat, yogurt, fresh fruit, cereal and more. Business travelers can also appreciate access to copy and fax services. This Onalaska hotel features spacious guest rooms with king beds or two queen beds with pillow top mattresses. For added pleasure, stay in the Executive Suites that come complete with a queen size sofa sleeper, coffee makers, refrigerators and microwaves..
We plan to add more related stuff like: pet friendly hotels in Onalaska, Wisconsin dog friendly hotels in Onalaska, dog parks in Onalaska, pet stores in Onalaska, WI, and pet spas in Onalaska. Keep checking for more!